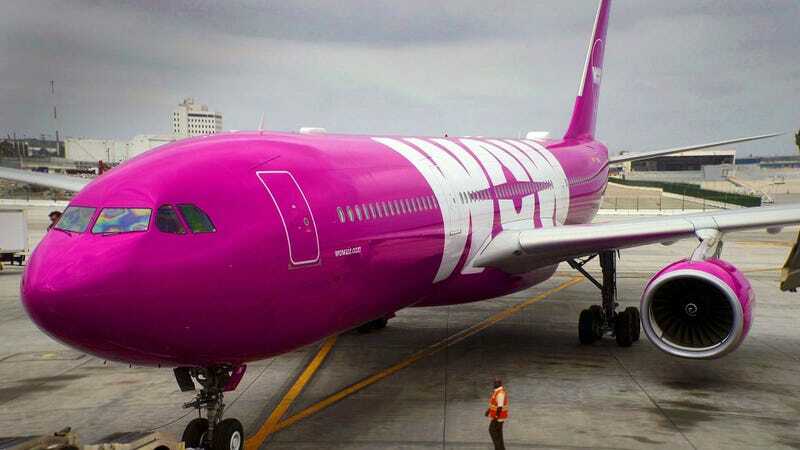 Budget airline Wow Air has ceased all operations and canceled all flights, leaving many passengers very screwed and very stranded. Before Thursday, Wow Air offered flights to 23 airports for fares as low as $50. The airline has been struggling in recent months. In November competing airline Icelandair pulled out of a plan to acquire the airline. A couple of weeks later the company announced it laid off 111 employees. Talks between Icelandair and Wow reportedly picked up again last week, but Icelandair again decided to scrap the idea. Wow Air released a notice on Thursday alerting travelers to the flight cancellations, effective immediately, and providing some insight on how they can get to their destination—basically, you’re on your own. The notice suggests passengers check for available flights with other airlines and advised them to ask their credit card company if they can get a refund for the ticket. It states passengers may be able to get compensation from the company. But it seems the airline is not issuing any automatic refunds. Wow Air did not respond to our request for comment and information on how travelers can get refunds. The sudden notice left many travelers on both sides of the Atlantic confused and scrambling to find a way to their destinations. Toronto publication BlogTO tweeted a video that seems to show angry would-be passengers at Toronto Pearson International Airport. The Icelandic Transport Authority issued a notice which EasyJet, Norwegian Air, Wizz Air, and XL Airways are offering reduced fares for travelers who are stranded because of Wow’s collapse.